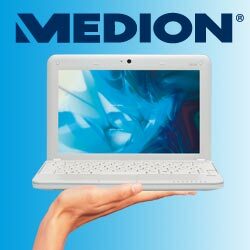 From next Wednesday Aldi has an Eee PC clone of Medion Brand on sale for Dkk 3.000. Everything looks promising. Specs recalls clearly more than the MSI Wind Asus Eee PC 900 , since there is a bigger screen, HD and RAM than the Eee PC’s on the market here at home. The machine comes with Windows, and the price is lower than 500, – with the MSI Wind same price as the Asus Eee PC 900 with Windows preinstalled, so it looks like it is a good buy. The only draw back that catches the eye is the lack of Bluetooth – at least for me since my plan is to run 3G over the phone rather than a special dongle for the purpose. I haven’t gotten that far yet since 3 is a bit slow on delivering a HTC Touch Diamond. But you need a little machine with more HD than the Eee PC 900 – and is indifferent to the SSD ( Which has the advantage of being more shock – resistant that is on the Eee PC, you can buy her at home), so could Medion machine be a sensible offer. MTP Data center sells Eee PC now? Update: Mid data sells Eee PC now?